Synopsis: Now that Chris and his girlfriend, Rose have reached the meet-the-parents milestone of dating, she invites him for a weekend getaway upstate with Missy and Dean. At first, Chris reads the family’s overly accommodating behaviour as nervous attempts to deal with their daughter’s interracial relationship, but as the weekend progresses, a series of increasingly disturbing discoveries lead him to a truth that he never could have imagined. Fifty Years after Guess Who’s Coming to Dinner (director Stanley Kramer,1967) comes Jordan Peele’s nerve jangling horror – a social chiller on white, liberal, racist attitudes in contemporary America. 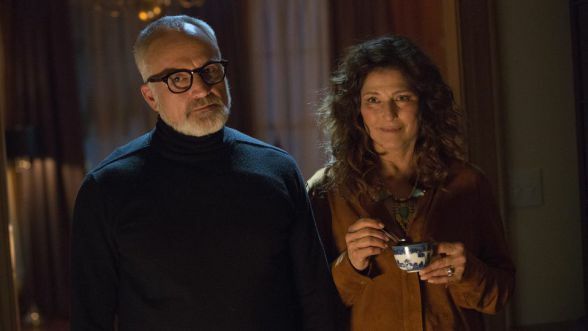 On arrival father, Dean (Bradley Whitford – [The Cabin in the Woods (2012); The West Wing (TV series, 1999-2006)] and psychiatrist mother, Missy [Catherine Keener – Captain Phillips (2013), A Late Quartet (2012)], greet them warmly. Initially, Chris reads the family’s overly accommodating behaviour as nervous attempts to deal with their daughter’s inter-racial relationship. Repeated assertions that” We would have voted for Obama a third time” begin to sound like a mantra; and the couple’s black servants have a peculiarly passive, ‘Stepford’ like attitude. As the weekend progresses, a series of increasingly disturbing discoveries lead Chris to a truth that he could have never imagined and he becomes ensnared in a more sinister real reason for the invitation.